When it comes to household energy, Britain is less than three years away from an affordability crisis, according to new research from independent price comparison and switching service uSwitch.com. While we all have a responsibility to use energy sparingly, we also have a right to a safe and warm hom.e According to the research, household energy bills have more than doubled in the last eight years. If this trend continues, uSwitch.com says the average annual bill is set to break the £1,500 barrier by 2015 and will continue upwards to hit £2,766 a year by 2018. An annual energy bill of £1,500 is the tipping point at which energy bills will become unaffordable in the UK, says the research. When this point is reached, 77% will be forced to ration their energy use, 59% will go without adequate heating and 36% will be forced to turn their heating off entirely. If bills then hit £2,000 a year - which the uSwitch.com forecast suggests could happen in 2016 - almost nine in 10 households (88%) will be rationing their energy use, 75% will be going without adequate heating and over half (55%) will turn their heating off entirely. With 55% of people & presumably a far higher proportion of pensioners having to turn off their heating the death toll is going to be horrendous. Far higher than the current 25,000 a year excess winter deaths. Doubtless the MSM, which is in the hands of the politicians, will continue to denounce the energy companies for the prices the politicians are 100% responsible for. That isn't going to save one life. All it can do will be to persuade those in the power industry to emigrate. But this isn't all of it, not even half. But all the rest has to be paid for too and ultimately is paid in higher prices for everything else - so households pay for it all, just mostly indirectly. So by 2028 the total costs will be not £2766 but £8,922. After taxes, direct and indirect that doesn't leave much for stuff like food. Worse than that such prices are going to force any part of the economy that can do so, i.e.manufacturing, into either emigration or bankruptcy, as they are unable to compete. Which has been happening for years and is getting worse. Britain's MPs overwhelmingly and Scotland's MSPs, unanimously, are engaged in a deliberate attempt to pastoralise the country and and kill people in a manner which is likely in time to exterminate more people than died in Cambodia's killing fields (25,000 a year for the last 15 years and rising). None of this need happen. At least 93% of the current £1252 average bill is government parasitism. Electricity bills could be reduced to around £100 a year, over time, by simply allowing the mass production of nuclear reactors with a level regulatory field for their use. Allowing the development of shale gas could do nearly as much, since US gas prices are already 1/6th of our rising ones and falling. Within days of starting an emergency development programme we would see the necessary business confidence that Britain was a sensible place to invest, bringing us out of recession. It would probably be a year before shale gas was being pumped into the system, bringing downward pressure on prices, and 3 years before the nuclear plants were making prices actually fall but would that not be better than "55% of households will have to turn of their heating altogether". Thanks to the reader who told me this letter had been published today in the Yorkshire Post. The new French President, Francois Hollande, is being given a considerable amount of credit for being for “growth not austerity” and by implication Britain’s Labour party gets the same. In fact, this is all smoke and mirrors. The Conservative Party in Britain is not practising “austerity” – borrowing £100bn a year is not austere by any normal definition of the word. Nor is Labour supporting growth. All they are proposing is to slightly increase this “austere” £100bn and let spending provide the illusion of growth. Growth is being achieved outside the EU – the world is growing at an average of six per cent annually, and has been doing so since our politicians first blamed the non-existent “world recession” for their achievements. What the world’s fastest growing economies have in common is growing economic freedom and allowing cheap energy. Every single MP (and economic journalist) knows that this is the formula that could get us out of recession and into fast growth within days if they wanted it. Thus, by definition, no single remotely honest MP denies this. Admittedly this means all the honest MPs and MSPs would fit in a minibus. This went out to newspapers across the country on 11th May so presumably it has been kept in case they needed a filler. Fair enough - one fact is that it is true, another is that the MSM has, except for this, absolutely refused to discuss the option of making a real attempt to get out of recession. Perhaps it is connected with Yorkshire being near the shale reserves though perhaps it is just happenstance. With the importance of the independence referendum and the massive, oligopolistic if not completely monopolistic control the BBC has over Scottish news reporting I wish to ask for some information. 1 - The BBC Charter requires that you show "balance" in all reporting not merely party political issues, though they are particularly obvious. Who is ultimately responsible for monitoring this coverage & how does he do it? 2 - The most recent polls show that UKIP has the support of 4% of Scots, matching the LibDems and twice that of the Greens. They do substantially better than that across the UK. The Scots Green leader almost a permanent fixture on the BBC; the Greens getting 40 times more coverage than UKIP per vote and thousands of times more supportive coverage, since only Peter Sissons didn't, before his removal, give the greens fully supportive questioning. What efforts is the BBC making to ensures that, over the entire period from when the new SNP government proposed the referendum, the coverage of UKIP (committed maintaining the Union) will be proportionate to their poll support and they will thus be invited to appear on "Big Debate" and similar programmes twice as often as Mr Harvie (committed to separation)? In England that will obviously be 4 times more often. I acknowledge that the ratio of coverage to overall support or perhaps even to supportive coverage to popular support is not quite as outrageously disproportionate between UKIP and the 2 larger parties, though obviously the ratio of straight coverage, without correcting for support, is far worse. 3 - Formal debate has always been a mainstay of democratic societies. Yet the BBC consistently refuse to allow it, inaccurately describing the Question Time format of "uncontrolled and unstructured yelling and aggressive arguing that leaves everyone annoyed" as if it were true debate http://utadebatesociety.org/formal-debating/ The BBC have specifically refused to allow any true debate on your channels or even to say why you will not consider it. I would now like to formally ask who sets the management policy of not permitting true debate; what reasons or memoranda have been produced to justify the decision; copies thereof; & the same for the decision not to respond to suggestions of allowing such. 4 - In the specific case of the AV referendum the BBC acceded to the wishes of the No campaign to hold no formal debate, despite the wishes of the Yes campaign that there be one. How was this management decision justified as consistent with the Charter duty of balance let alone of public service? 5 - Has a decision been taken to allow no formal debates on the independence referendum. If so how was the decision reached. If not when are such debates to be allowed and how many of them. 6 - Some years ago Damien Whyte, the BBC manager for answering complaints responded to me by stating that the BBC do not deliberately censor to promote racial genocide. I asked him how this could possibly be true bearing in mind the total censorship of the massacre of at least 210 unarmed civilians by British police outside the British HQ at Dragodan in Kosovo. He promised to check the facts and reply but I am still awaiting that reply. I would like to know why no response was made. Bearing in mind the massive coverage of the possible killing, in unknown circumstances of about 100 people in a much smaller but otherwise possibly comparable massacre in Syria, were BBC coverage being determined in any way by journalistic standards the Dragodan massacre, the direct legal responsibility of this country's leaders would have received many 10s, perhaps hundreds of times as much coverage & still be regularly reported today. Therefore I would like to know who was responsible, in management or acting in a management capacity in this instance, for the initial and continuing censorship of this atrocity, comparable to My Lai or Lidice & what the official reasons for doing so were?. I know that there is a "journalistic materials" exemption from the FoI Act and that the BBC regularly use it to conceal such little known facts as the number of times a BNP guest has been invited to appear on Question Time, however all these questions involve management decisions not those of on screen staff let alone of anybody in anything like "the collection and editing of news for presentation", aka "journalism", assuming that editing for presentation of information is different from, indeed precisely opposite to censoring for suppression. It applies to "public authorities at all levels ... quangos, regulators, advisory bodies, publicly owned companies and the BBC and Channel 4 (though not in relation to journalistic materials)." (p7) It reads like that exception was requested by the BBC as a way of ensuring journalistic sources could be protected. They used it previously to avoid answering a question about the ratio of Question Time appearances by the BNP and the Greens. The BNP, getting twice the vote of the |Greens are entitled, under the BBC's duty of "balance" to twice as many appearances. In fact everybody knows that the BNP have only been allowed to appear once, on a programme which the BBC too obviously set up as a lynching, whereas the Greens are on about 1 in 5 programmes, which makes 120 appearances since 2000. If the BBC are able to prevent this being put on the record they are able to prevent the fact that they are therefore no more than 1/2 part in 120 (0.0042) honest and 99.6% totalitarian fascist propagandists, but everybody knows it is the case. The requested acknowledgement has not been received. One way used to break the law, which I have experienced, is to pretend that the letter/email must have got list in the post. So I am sending it again. The silence of academics on this matter is interesting. Though it is not total. Steuart Campbell (possibly Scotland's most respected science writer) contributed section 4 here. Freeman Dyson, one of the world's most eminent physicists has previously told me that he does not believe that such very low level radiation is harmful at all. In fact he says of the directly opposite theory, known as hormesis, that this radiation, if it were present at Dalgety, would actually be beneficial to health "which I find quite likely" http://a-place-to-stand.blogspot.co.uk/2010/11/freeman-dyson-guest-post.html. Professor Fred Singer, who had a prominent scientific career long before becoming dean of the warming sceptics and Jerry Pournelle, the space scientist who chaired the committee who persuaded Reagan to support SDI have been equally dismissive of the basis on which this entire scare story is based. Having seen the understandable unwillingness of individual scientists to "put their heads above the parapet" over global warming and the way that those professional bodies that get government funding line up behind government policy I am sanguine about any of them being wiling to take a stand here. However I have decided to send a copy of this article to members of the radiological departments of Scotland's Universities to see if they would care to comment to ThinkScotland or myself. 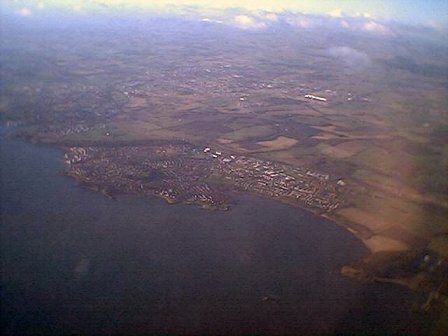 My undernoted article on the alleged radiation "threat" at Dalgety Bay http://www.thinkscotland.org/change-scotland/articles.html?read_full=11466&article=www.thinkscotland.org has recently been published by the online news website ThinkScotland. It raises a whole range of questions about this scare story including, is the possible maximum theoretical amount of radium there no more than 1 part in 35 billion of the naturally occurring radioactives there? Is this an amount on which such scare stories can credibly be based? Is there any actual scientific evidence whatsoever for the scare story that low level radiation is harmful? SEPA themselves have confirmed they know of none and have to rely on evidence free assumptions by other functionaries. A statement either way would be appreciated. I realise that saying that the scare story produced by a government department is without scientific foundation might be ticklish and if, for that reason, you feel unable to reply I will understand. In that case I hope you will be prepared to forward this to an emeritus member of staff, who could safely reply. From the Register, once again proving that the only place you can go for truthful journalism is the net. The obvious corollary - that MSPs and BBC etc journalists are, unanimously, either mentally subnormal or, more likely, lying about their alleged belief in catastrophic warming. In which case they are wholly corrupt whose only concern for the public is how best to lie to us and steal from us. If there is a logical flaw there I'm sure some Green will point it out, but I think there isn't. Another from the same source. After the IPCC accused anybody who doubted their lie about the Himalayan glaciers melting, indeed being entirely melted by 2035 - they later claimed it had simply been an arithmetic error and it was 2350 - comes this proof that they are actually growing. new study of survey data gleaned from space has shown a vast region of Himalayan glaciers is actually gaining ice steadily, mystifying climate scientists who had thought the planet's "third pole" to be melting. The study was carried out by comparing two sets of space data, the first gathered by instruments aboard the space shuttle Endeavour in 2000 and the second by the French SPOT5 satellite in 2008. The results were unequivocal. Across the targeted 5,615km2 region of the Karakorum mountains lying on the Chinese border with India and Pakistan, the glaciers had gained substantial amounts of mass by the time the second survey was carried out. Perhaps the corrupt totalitarian fascist parasites leading the BBC will soon be using this as "proof" for the next ice age scare story they try to scare us with. On May 17th I sent this FoI to the Food Standards Agency in Scotland in their ban of fishingm & received this today, so at least they deserve some credit for not waiting till the last legal moment, or beyond. My questions are in normal, their answers in bold and my comments in bold italics. 1 - What evidence, from the FSA's knowledge, do you have of "radium" being found on the beach? If none write "none". Radium contamination was first detected in 1990 as part of the routine environmental monitoring report. Subsequent surveys bring the total number of radioactive particles and items recovered to date to over 2,000. ... results are available on SEPA's website. This is false. Radium has not provably been detected. All that has been detected is radiation, some clumped in what are described as "particles". SEPA have repeatedly refused to produce any actual evidence of radium in response to FoIs asking that precise question, indeed this refusal to do so or admit the lack is now subject to an appeal..
2 - What background readings of radiation has the FSA made at this beach and at others nearby, as a control, and have you found the radiation level higher at Dalgety Bay? Of none and no write "none and no". SEPA does not undertake such monitoring either. So it is accepted that there is no evidence whatsoever that the Dalgety Bay radiation exceeds that of neighbouring beaches in intensity or particularity/clumpiness. 3 - Does the FSA accept SEPA's evidence that the radiation at Dalgety Bay is "less than 2/3rds background in Aberdeen" and that this also makes it as low as 1% of the radiation level in various places around the world from which the FSA does not ban imports? If yes answer "Yes". Since he has admitted is no evidence that the "particles" are more common than on neighbouring beaches let alone as common as across Aberdeen. On the question of whether being in particles is more "dangerous" than normal background radiation see answer to #5. 4 - Does the FSA dispute evidence that the maximum theoretical level of radium from these dials, had all of it been deposited on the beach and none of it washed or blown away over the last 60 years, would not exceed 25% of naturally occurring radium there or 1/35,000,000,000th of the total naturally occurring background radioactives there? If you do not dispute it answer "no". Yes. A "theoretical level" is simply a theory not evidence. It is evident from the heterogeneity, of the items discovered, the uneven distribution of deposits and historical accounts that the contamination derives not just from luminised dials, but as a result of debris from repair, reluminising work, and disposal of luminised items carried out on-site. The maximum amount is based on the historical accounts and unlike by the FSA, has not been disputed by SEPA in any way, even under the legal pressure of FoIs. He is misusing the English language here using "theoretical" as if it meant "drawn from theory" when in fact it clearly means "an absolute maximum, from the known facts above which the radium level could not go, though in non-theoretical conditions it is likely much of it will have been lost over the last 60 years". The distribution cannot be said to be uneven since, as acknowledged, there has not been a search elsewhere. I am not sure in what way the particles/clumps discovered can be said to be particularly heterogeneous. While one would expect any painting to be purely of the aircraft dials in question claims that the radiation comes from other "luminised items" rather than just dials have not been made in previous FOIs. It would seem to require some evidence that Dalgety Bay airfield was also a radium watch factory or laboratory for refining pitchblende to obtain natural radium. This is an extraordinary new claim for which no evidence has been produced and goes against all common sense. 5 - If the answers are as I suggest then it is obviously impossible to honestly claim there is a real radiation threat to food there, let alone one which, if the rules are applied honestly, would not Is there another credible option? If no answer "no". If there is please give it. Yes, the contamination has arisen from local historical activities and is confined to the Dalgety Bay area. Additionally the contaminate is particulate and some particles are small enough to be ingested by seafood such as winkles and mussels. If these were subsequently consumed they could cause direct damage to the human gut and an increased risk of cancer. Laboratory studies have shown that some particles would be soluble in the human gut which would increase the potential dose. than a 35 billionth. Nor has any evidence been produced that it is "confined to the Dalgety Bay area" since neither SEPA nor the FSA have looked. That being the case and they have not been" closing down all fishing from Aberdeenshire and points north let alone prohibiting any food imports from much of the world" then it is proven that "only possible reason for doing this is to deliberately promote a fraudulent scare story" by a wholly corrupt and parasitic organisation..
"Laboratory studies have shown that some particles would be soluble in the human gut which would increase the potential dose" is a particularly interesting remark for 2 reasons. Firstly, since the paint was water soluble virtually all, not merely "some" of the "particles" should be water soluble - if they aren't natural particles. Even more importantly it is an acknowledgement that they know all the stuff said in answer to #3 about this radiation being dangerous in a way background radiation isn't is because it is "particles". This is the "hot particle theory and is accepted by wikipedia and apparently even by the FSA when it suits them, as false. Calling things "particles" is clearly disingenuous if you don't mention size. Everything is a particle but, by the laws of geometry, the larger a particle proportionately the less surface area it has, to contact anything outside so for equal amounts of radioactives and background radiation, it would be better for it to be in particles and anybody using particularlity rather than background radiation as the measure of danger is lying. The FSA has done so but has also achieved the remarkable feat of claiming the precise opposite as well in the same letter. 6 - If the answer to 5 is no is there any specific ruling applying to Dalgety Bay but not the rest of the country that prevents this action from representing the very highest standard of honesty the FSA Scotland aspire to or that would make any ruling on any food matter by you infinitely more trustworthy than this. If none and no answer "none and no". The FSA has a statutory responsibility to protect consumers through ensuring food safety and has taken a precautionary approach, based on the best available evidence, in order to discharge the responsibility. That appears to be "none" and "no" then. Note the use of the term "precautionary approach". This is basically a way of saying "we don't need no stinkin evidence" & relegates the entire organisation into the realm of unscientific quackery. Of course if they were honest non-scientific quacks, who actually believed a word of their own scare story they would also be banning imports of food from the "various places around the world from which the FSA does not ban imports" but are up to 100 times more radioactive. Thank you for the FSA's reply. I am including my blog comments for you to comment on should you feel you can enhance the FSA's credibility in any way by doing so. Your answers bring up obvious further questions which I would be obliged for a reply to under the Act..
1 - What evidence do you have for your claim that some of the 0.25g which might have been spread over the area 60 years ago, has been detected by chemical or other means? If you have none your first answer is untrue and must be corrected. 3 - What is your evidence that the hot particle theory, on which your claim that only the particularity of the materials, not the overall level is important depends, is correct? 4 - What is your evidence for the claimed, but previously unknown, other radium contamination not linked to dial paint? What is your evidence that the distribution of "particles" is different from that at Dalgety in neighbouring beaches which both SEPA and yourselves admit you have not similarly examined? In both cases, if none answer none and provide a new answer. 5 - See 4 above. If no control sample has been attempted on neighbouring beaches how can it be possible to say that the radiation is only at Dalgety? The alternative being that it is natural and occurs elsewhere. Also what is your evidence that the opposite ofv the hot particle theory is true and that radiation reduced to undetectable particles in solution, comparable to background radiation, is the more dangerous? 6 -The evidence free, anti-scientific "precautionary approach" would require the banning of any imported food that might come from an area of up to 100 times more radiation than Dalgety, or even from Aberdeen. Indeed technically it would require you to ban selling haggis on the grounds that it might attract flying saucers - a hypothesis for which there is no evidence, but then that is the point of this principle. Will this principle be applied without prejudice? I accept your agreement on #2. As ever the BBC don't do real formal debates. What they do is the Question Time format with the BBC choosing the questions & the speakers. Proper debates require rotating speeches of about 2-5 minutes on both sides with the succeeding speaker expected to rebut the previous one, or at least attempt to do so, without interruption. The moderator's job is simply to keep order. To be fair to this programme it came rather closer to a debate than most. Isabel Fraser the compere tended not to interrupt, though the guests did, and there were the same number of people on each side, a prerequisite of true debate and quite rare on out state broadcaster. During the warm up before filming started Isabel said that the large majority of the questions provided by the audience had been about economics. As ever its the economy stupid. There were 3 of us from UKIP in the audience, though I had not disclosed my affiliation. Since this is about 3.5% of the population & 4% support UKIP it was pretty close to proportionate but neither of the known UKIP's had their questions taken. Peter Adams the Scottish party secretary was wearing a UKIP shirt which the cameras managed to miss any close shots of.. I was actually answering a point made near the start - Somebody, probably a separatist (it was clear from the level of applause of Sturgeon that they were a majority) had asked how much better off did they predict we would be with independence 10 years from now. Patrick Harvie had answered that we would be wrong to take economic growth into account when voting because that was of no importance compared to the "happiness index" he had been working on. He clearly didn't expect and certainly didn't wish for any. He also said that the government's "neoliberalism" was responsible for the recession. He is either wholly ignorant of what neoliberalism is and how it differs from the Big State economy we have now or wholly dishonest and knew he was lying. When it came to the SNP turn she evaded answering at all and certainly did not hint in any way that she disagreed with this policy of permanent recession. When I got my chance I said I was horrified (true but not surprised) that the separatists seemed not to expect any growth whatsoever over 10 years. With the rest of the world (ie outside the EU) managing a growth rate of 6% in 10 years it will be nearly twice as well off (180%) and that "I do want to live in a better off country"
When I ended the SNP guy in the light blue shirt who spoke just before turned round and said, off mic, that I wasn't going to get the choice. The best hit of the evening was when Ruth Davidson, after Sturgeon said that the EU would definitely not insist on Scotland accepting the euro as new members are required to, produced a letter showing that nobody in the SNP had ever actually asked anybody in the EU commission what the legal case was..
On the other hand she subsequently supported continued NATO membership on the grounds that because "of the work our troops did there (in Kosovo) preventing ethnic cleansing". I shouted out loudly but the microphones barely register it that "that is a lie - NATO ethnically cleansed 350,000 people from Kosovo". This is undeniably true and I will see if she possesses sufficient trace of honesty to acknowledge it. Obviously the media are careful what hecklers they report. I will also be writing to the SNP to see if they want to disagree with the permanent recessio9n prediction of their partner and if so what growth rate is their aim. This morning the BBC did a follow up on Call Kaye once again starring the permanent feature, Harvie & the Labour deputy Anwar. This debate, well the phone ins contained quite a bit about not wanting permanent recession. Kay's support for separatism was quite clear saying that "any decent person" was at least attracted to independence with Green Luddism & asking a phone in, who said he was a banker that he should "acknowledge the fact" that the recesiion was due to the bankers & "neoliberals". If the BBC continuously put such liars on air it must be assumed they are doing so deliberately. I did ring up but wasn't included. This plus the fact that they give 40 times more coverage to the Greens and thousands of times more supportive coverage (the omnipresent Harvie is never matched by similar appearances from the party with twice as many supporters in Scotland (& 4 times across the UK). However I am convinced that the Yes campaign has holed itself below the water line with this commitment to permanent recession. It will be interesting to see if the No campaign give them the chance to patch it. There has been an election in Serbia and it was won by what is called here a "pro-Russian nationalist" though the BBC regularly use the term "ultra-nationalist" since the more conventional terms "nationalist" or "patriotic" are insufficiently pejorative for these propagandists. That means that, after 2 decades of trying to join the EU, including handing over 2 former presidents & one person about to be elected president, the people don't like the idea. Another condition subsequently added by the EU was that Serbia should recognise the NATO/EU seizure of Kosovo. Nikolic has close ties with Russia and has in the past even said he would rather see Serbia as a Russian province than an EU member. And with the euro imploding, the EU in recession, while Russia's growth rate is 4.3% (not the non-EU world average, or indeed Serbian average over the last few years, of 6% but much better than the EU's zero) and Greece, their southern neighbour being savaged clearly the Serbian people have no reason to disagree. The fact that NATO?EU have proven themselves racist, organlegging, Nazi war criminals gives the Serbs and indeed the rest of the world no reason to love us either. Previous elections, where NATO had the upper hand have been widely covered by our media, albeit in the traditionally censored manner. This one hasn't which shows they knew that the game was up. The Warsaw Pact did not fall because of the intellectual failure of communism, or because of western military threats, though both played their part, but because of the economic failure of Soviet communism. This election is part of a trend marking a similar failure for the bureaucratic corporate fascism of the EU countries, which is failing almost as badly as Soviet communism did in an environment far more benign to it. Russian President Vladimir Putin on Saturday warmly received Serbia's president-elect Tomislav Nikolic, saying Serbs are Russia's spiritual brothers and promising Belgrade an $800 million loan. Nikolic -- who is due to be inaugurated by June 1 -- had symbolically chosen to make Moscow his first foreign destination following his presidential poll win against the incumbent Boris Tadic earlier this month. "You know that we see Serbia not only as our traditional and very important partner in the Balkans," Putin said, congratulating Nikolic on his victory. "We see Serbs as our spiritual brothers. And that is what is at the base of our relations today and in the future," Putin said, addressing Nikolic as "Mr President", according to the Kremlin website.